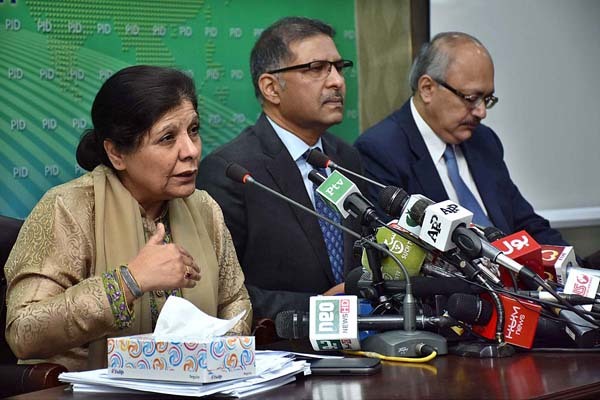 ISLAMABAD, Jun 12 (APP):Finance Minister, Dr Shamshad Akhtar said Tuesday the caretaker government would not do any new agreements or start negotiations with International Monetary Fund (IMF) for any bailout package, saying that any decision to this effect to be taken by the upcoming elected government. Addressing a news conference, accompanied by Minister for Information Ali Zafar, the Finance Minister said it was necessary that the caretaker government reflected on medium-term macroeconomic stability framework and for this purpose it could consult any domestic or international stakeholder for feedback. macro-economic challenges in short-term and how they should be dealt on long-term basis. To a question, she said that government was reflecting on debt repayment mechanism keeping in view its reserve position and working to arrange alternate sources of financing. She said that the government would honour its debt liabilities and it was reflecting on how to do this challenging job. Talking about the hike in petroleum prices, the minister said that there was an institutional mechanism in place, which determined petroleum prices in a systematic manner by utilizing a set formula. Principally, she said, the oil prices of Pakistan were linked with the international Arab Gulf market prices. She said that oil prices volatility was a reality and every government had to adjust prices accordingly. She said that that there had been 6 to 11.5 percent increase in oil prices in Arab-Gulf Market, however the previous government maintained old prices deferred the decision till June 7 for the caretaker government to decide. She was of the view that the prices were increased after a deliberation, adding that the oil prices were having significant fiscal impact. She said that only partial impact (50%) was passed on to consumer in compared to international increase. She, however maintained that the oil prices in Pakistan were lower as compared to the regional countries including India and Sri Lanka. She said that price totality was a reality and there was need to increase prices timely in future to reduce burden on national exchequer. She said the government would continue the policies where OGRA remains the oil price setter. Talking about the condition of economy, she said that the real Gross Domestic Product (GDP) has witnessed strong growth of 5.8 percent, saying that this financial year would close on the same growth rate. She expressed satisfaction that the growth had been broad-based as every sector including agriculture, industrial, services and supply sector contributed in the growth. She said that the inflation had also been contained to manageable range, thought there had been some increase in core inflation, and however added that the increase in oil prices and adjustments might lead toward upward trend in inflation. The Minister said that the current account deficit was among serious problems, the country was facing. The target of current account was also missed and it slipped 1.6pc of GDP, citing slow export growth one of the reasons for this negative trend. However, she said that the exports from the country had been witnessing increasing trend, which was a positive sign. She said that the exports from the country were recorded at $20.6 billion against the imports of 45.5 billion, showing gap of over 24.9 billion. Second challenge was fiscal deficit which has touched 6.1 figure against the target of 4.1 percent, hence running above the targets. The third issue is debt issue, as the public debt has been growing at fast pace and reached to significant level of 70 percent of GDP against 64 percent in 2013. She expressed concern that the public debt was not consistent with federal debt limitations which is over and above that. Finally, she said the public sector entities were a problem, stressing the need for structural reforms overcome these losses. To a question, she said, that circular debt was off budget item and it would remain same. Talking about the depreciation in Pakistan rupees value, she said that the exchange rate should be determined by market forces. Let the interbank market operate. The government would only intervene if there are speculations in the exchange rate. She said that the revenue collection could also be short of target and said that the target fixed was optimistic which should be realistic.